Alexis Herman, US Secretary of Labor, political activist, civic leader, social worker, and entrepreneur, was born on July 16, 1947 in Mobile, Alabama to politician Alex Herman and educator Gloria Caponis. Herman graduated from Heart of Mary High School in Mobile in 1965 and enrolled in Edgewood College in Madison, Wisconsin, and then Spring Hill College in Mobile, Alabama before transferring to St. Xavier University of Louisiana in New Orleans, where she received her Bachelor of Arts in Sociology in 1969. She joined the Gamma Alpha Chapter of Delta Sigma Theta during her college years and supported this sorority throughout her career. After graduation, Herman worked with Catholic Charities in Pascagoula, Mississippi and several other agencies promoting minority employment for women and youth. She also fought for unskilled African Americans in the shipbuilding industry. An active Democrat during this time, Herman met Jimmy Carter while he campaigned in Atlanta, Georgia. Upon his successful bid for office in 1977, Carter appointed Herman to the Department of Labor’s Women’s Bureau making the 29-year-old the youngest person to hold that position. During her four-year term, she fought to improve conditions for women’s employment and succeeded in getting several corporations, including Coca-Cola and Delta Airlines, to hire women for upper-level corporate positions. With the completion of the Carter administration, Herman formed A.M. Herman & Associates in 1981. She also continued working for the Democratic Party and as vice chair for the 1992 Democratic National Convention. With President Bill Clinton’s victory, she once again entered public service as deputy director of the Presidential Transition office. In 1994, she was investigated for taking bribes and campaign donations when she was an aide to Clinton. Bill Clinton testified on her behalf and in 2000, the unsubstantiated allegations were dropped. During the Clinton administration, Herman also worked as the Public Liaison for the White House and in May of 1997, she became the first African American to hold the position of Secretary of Labor and only the fifth woman in the history of this office to be appointed. Almost immediately she was drawn into the middle of the UPS strike and successfully mediated the conflict for the workers. During her tenure, she also actively sought to improve and expand child labor standards with the Youth Opportunity Grants program, which brought money to youths in poor areas for employment and education. She orchestrated the 1998 Workforce Investment Act passage, which improved job placement centers. The election of 2000 found Herman actively aiding the Campaign for Vice President Al Gore, and she was again to assume a position on the transition team for the White House, but the upset in Florida curtailed this work. Herman married Dr. Charles L. Franklin, Jr. and lives in McLean, Virginia. She continues to be active within the Democratic Party and served on the Democratic National Committee’s Rules and Bylaws Committee as well as other committees and advisory boards. She is also chair and chief executive officer of New Ventures, LLC, and holds positions on numerous boards, including Xavier University, Toyota Diversity Advisory Board, Sodexho Business Advisory Board, Entergy Inc., MGM Mirage, and Coca-Cola Company. 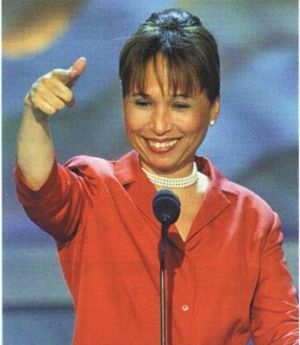 In 2007, she was inducted into the Minority Business Hall of Fame. Today, Herman continues her work with several civic groups, including the National Urban League, the National Epilepsy Foundation and the George Meany National Labor College. She also serves on the board for the Clinton-Bush Haiti Fund and supports activities for her sorority, Delta Sigma Theta.